How to Convert M4V to MPG (MPEG)? Why We Need to Convert M4V to MPG? iTunes provides a large number of movies, TV shows, music for purchase or subscription. To our disappointment, the rented and purchased iTunes videos are encoded as M4V files, which make it impossible to enjoy these videos on non-Apple devices, such as Samsung Galaxy Series, LG Phones, Smart TVs, Stream Players like Chromecast, Roku, ect. That’s why there are a batch of people seek to remove DRM and convert iTunes M4V to plain video format like MPG. MPG is a common digital video format standardized by the Moving Picture Experts Group (MPEG). It typically incorporates MPEG-1 or MPEG-2 audio and video compression. You can freely enjoy the MPG videos on mattter which OS you are useing, Windows or Mac. What is more important is that, you can stream the MPG videos to you big screen and HD TV for enjoying. 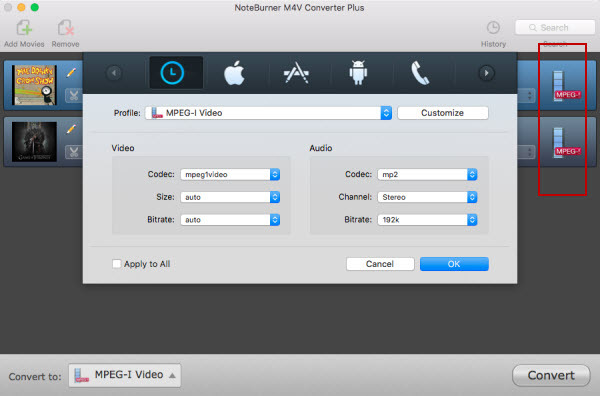 Thus, you can have a better experience with M4V videos if you convert them to MPG files. 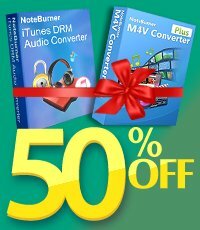 To get lossless MPG video files, the impressive and intuitive NoteBurner DRM M4V to MPG Converter can help you. It is specially designed to convert iTunes DRM M4V videos and can fast convert iTunes DRM M4V videos to MPG with lossless quality. In addition, it can not only convert M4V to MPG, but to tons of other video formats, such as MP4, MOV, AVI and FLV, and even to audio formats like MP3. Convert both DRM M4V rented and purchased files to MPG within several clicks. Convert iTunes DRM M4V to other popular video formats, such as MPG, MP4, MOV, AVI, FLV, ect. Convert DRM M4V to MPG at fast speed. 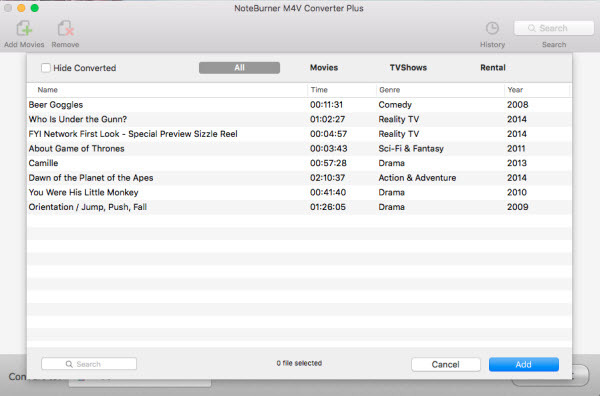 Launch NoteBurner M4V to MPG Converter, and click the "Add Movies" button with a following pop-up window to add iTunes videos. You can add both iTunes rented and purchased videos as you want. 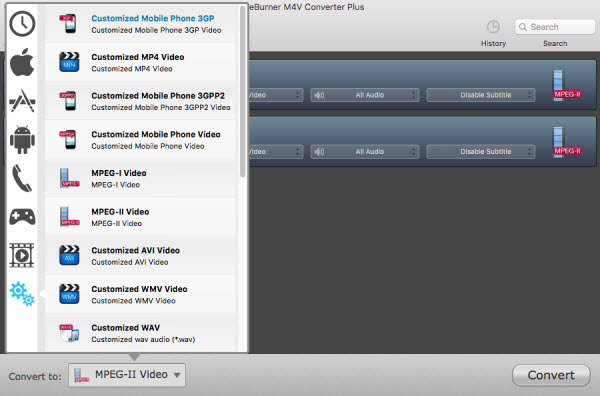 To convert M4V to MPG, please choose output format as "MPEG-I Video" or "MPEG-II Video". You may find there are many other formats available for choosing. Customizing option is available by clicking the format icon on the end of each added movie list. There would be a window pops up to let you customize the output video. Click the "Convert" button to start converting M4V to MPG Format. After it is done, you can find the converted SWF video, and transfer them to your devices for watching. Please note that there is also Windows version for you to convert DRM M4V to MPG. You can learn more about NoteBurner DRM M4V to MPG for Windows here. What's next? 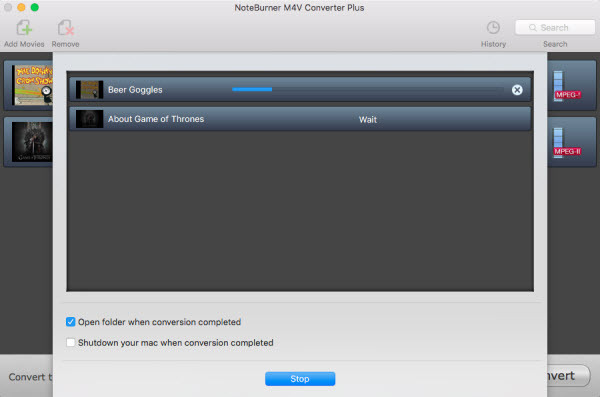 Download NoteBurner iTunes M4V to MPG Converter now!